Plant System Hospital No. 1 in 1872. The Lake Monroe and Orlando Railroad was organized in 1875. The charter planned to construct a railroad from the St. Johns River port in Sanford south to Orlando. On October 16, 1878, the South Florida Railroad was incorporated, but did not receive a charter until December 9, 1879, when it gained control over the Lake Monroe and Orlando Railroad charter. The first train on the new railroad ran between Sanford and Orlando on November 11, 1880. Henry B. Plant (1819-1889) and his Plant System purchased three-fifths of the South Florida Railroad stock on May 4, 1883. Plant standardized the track sizes, stations, and equipment of the existing railroads and began laying tracks towards Tampa, whose railroad station opened on December 10, 1883. In 1893, the Savannah, Florida and Western Railway, which was also a part of the Plant System, acquired the South Florida Railroad. The Atlantic Coast Line (ACL) Railroad Company acquired the entire Plant System in 1902. In 1967, the ACL merged with the Seaboard Coast Line (SCL) Railroad, which is now operated by CSX. 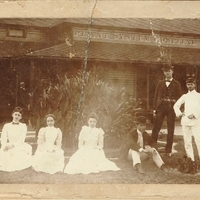 By the mid-1880s, Sanford, Florida had become a major distribution center due to the city's strategic location along Lake Monroe and the St. Johns River. The other major hub for the Plant System of railways was located in Waycross, Georgia. Both towns benefited from the building of a Plant System Hospital that served Plant’s employees and the community. The Plant System Hospital #1 was Sanford’s first hospital. It was later moved to Waycross. Original 8.5 inch x 5.25 inch black and white photograph by the Ensminger Brothers, 1892: Vincent Collection, Sanford Museum, Sanford, Florida. Digital reproduction of original 8.5 inch x 5.25 inch black and white photograph by the Ensminger Brothers, 1892. Originally created by the Ensminger Brothers. P. O. BOX 204, = = SANFORD, FLA.
A fine list of War Views lately comprised in the General Collection. Ensminger Brothers. “Plant System Hospital No. 1.” RICHES of Central Florida accessed April 25, 2019, https://richesmi.cah.ucf.edu/omeka/items/show/4065.